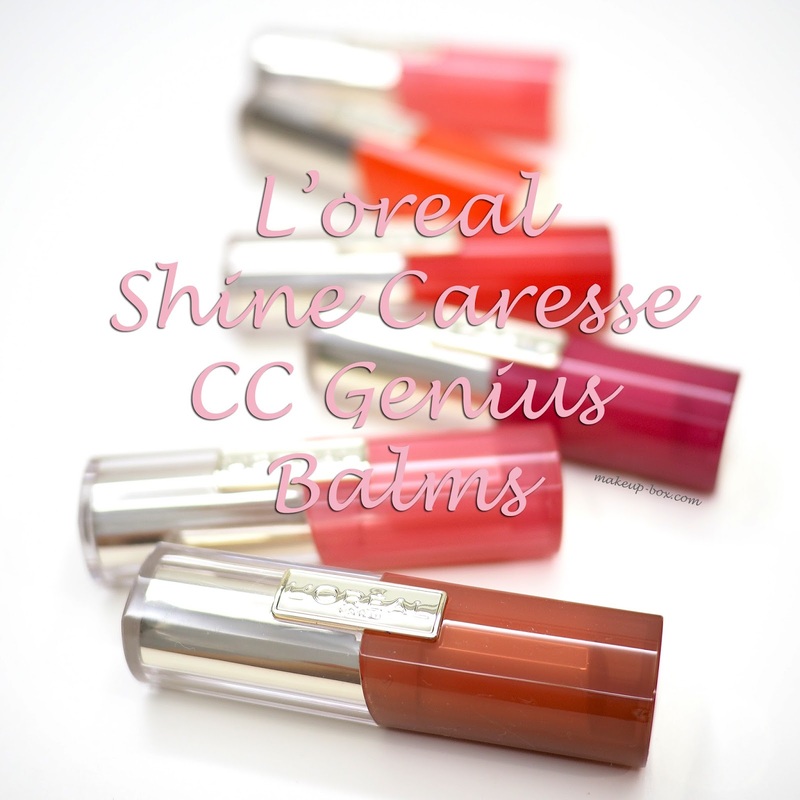 L'oreal is launching 6 shades of Shine Caresse CC Genius Balms (SG$19.90) in April in Singapore, and I haven't been able to keep my hands off these the entire week. I've been wearing them to work daily, and I'm in love with the soft medium pinks in the series. If you've followed me for a certain amount of time you will know I am a huge lover of matte lipsticks and intense opaque formulas in general. But in the recent year or so, my lips have been feeling quite dry and prone to flaking and rashes. I get around that by wearing creamy nourishing formulas more. I'm probably committing beauty blasphemy by saying I didn't quite like the Revlon Balmstains (except the matte ones) and Colorburst Lip Butters that were so incredibly popular a couple of years back. Somehow the many separate times I bought and tried them repeatedly, I found many of the colors a bit patchy and the formulas not really that hydrating on my lips. In fact I was probably irritated by some ingredient in them as I would mostly flake or itch after a few hours. My favorite "swipe on and go without a mirror" lipstick in recent years was actually a Colour Riche Balm from L'oreal, which was not sold in Asia and that a friend in the US sent to me to try. So I was very excited to see that they were bringing the new Shine Caresse CC Genius Balms to Singapore. Though there are only 6 shades available in Singapore, I have to say they are all beautiful choices. The light is a bit bright above, so you should expect the colors to be slightly deeper than they look above. My favorite is the warm candy pink 704 Statement Pink, which I had thought would look too bright and garish, but turned out quite lovely. But 713 Daydream Beige, 703 Ispahan Rose and 706 Drama Burgundy are gorgeous as well. 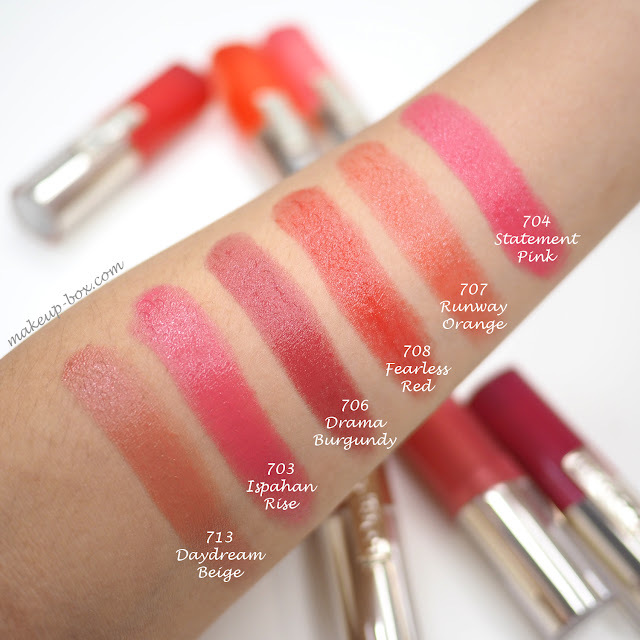 I had expected 708 Fearless Red to be patchy and uneven based on the wrist swatch, but the texture of the formula smooths out easily on the lips and it really did not look patchy on me once I pressed my lips together. These have become my current "swipe and go without a mirror" choices. Don't expect these to last like long-wear formulas, but they don't disappear quickly either considering the creamy balmy formula. The brighter and deeper shades cling a bit better and will provide a mild staining effect. Not a lot - just enough that the color doesn't just disappear too quickly. And they feel so plush and smoothing that I don't mind reapplying them like balms anyway. All in all, worth checking out!